Short and sweet, if you’re looking for a portable and powerful table saw, then this model is just for you. Across all rating areas which is what professional type users look for, the DEWALT DWE7491RS 10-Inch Jobsite Table Saw with 32-1/2-Inch Rip Capacity and Rolling Stand rates highly in all areas. The slight cons are more to be expected and have no effect on long-term performance. A job site table saw is a must have for contractors and serious woodworkers as the versatility is something you just won’t find in a standalone model. Giving users the ability to move the saw from site to site while giving them the same amazing power found in full-sized models makes it possible to get the same great results at any location. 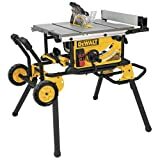 The DEWALT DWE7491RS 10-Inch Jobsite Table Saw with 32-1/2-Inch Rip Capacity and Rolling Stand has become a best-seller on Amazon, and priced hundreds less than other manufacturer’s models helps. Boasting a wide rip capacity, powerful motor, and complete with a rolling stand that is easily collapsible lives up to DeWalt’s lofty expectations. The DEWALT DWE7491RS 10-Inch Jobsite Table Saw boasts a wider rip capacity than most others in its price range coming in at 32 ½-inches. This is large enough to rip large shelves and other products with ease while giving user the peace of mind with accurate cuts with ease. DeWalts patented construction also gives you the ability for narrow cuts, and everything in between. When comparing it with older models, the improved fence system provides plenty of material support where the others were lacking. Powered by an efficient 15-amp motor, the DeWalt DWE7491RS has more than enough power to rip through the toughest of hardwoods. Highly recommended for enthusiasts and professionals of all types including cabinet makers, deck handlers, flooring installers, carpenters, trim handlers, and novice woodworkers. The 10-inch DEWALT DWE7491RS Jobsite Table Saw features great depth of cut from all angles. Giving users the ability to rip 3-1/8 inches at 90-degrees and 2 ¼-inches at 45-degrees, there’s no job this power tool can’t handle. While cutting, a vacuum attachment can easily be attached from the rear through the 2 ½-inch dust port. Attachment is simple, and the collection system is improved over the former model with the riving knife outfitted with its own dust chute. This minimizes airborne particles and dust which becomes problematic and was a problem 744 and 745 series saws.